Contaminated water with dangerously high levels of radiation is leaking from a storage tank at Japan’s crippled Fukushima nuclear plant, the most serious setback to the clean up of the worst nuclear accident since Chernobyl. The storage tank breach of about 300 tons of water is separate from contaminated water leaks reported in recent weeks, plant operator Tokyo Electric Power Co said on Tuesday. 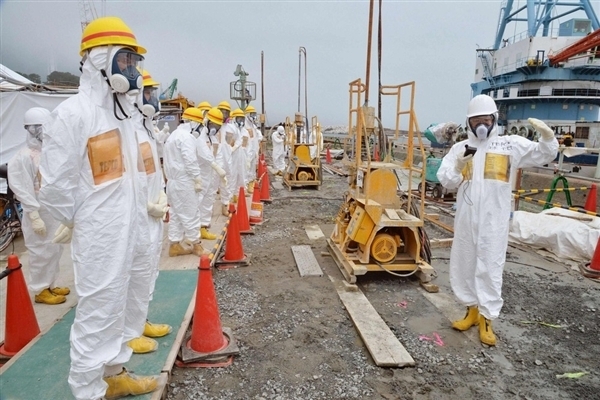 The latest leak, which is continuing, is so contaminated that a person standing 50 centimeters (1.6 feet) away would, within an hour, receive a radiation dose five times the average annual global limit for nuclear workers. “That is a huge amount of radiation. The situation is getting worse,” said Michiaki Furukawa, who is professor emeritus at Nagoya University and a nuclear chemist. The embattled utility Tokyo Electric has struggled to keep the Fukushima site under control since an earthquake and tsunami caused three reactor meltdowns in March 2011. Japan’s Nuclear Regulation Authority has classified the latest leak as a level 1 incident, the second lowest on an international scale for radiological releases, a spokesman told Reuters on Tuesday. But it is the first time Japan has issued a so-called INES rating for Fukushima since the meltdowns. Following the quake and tsunami, Fukushima was assigned the highest rating of 7, when it was hit by explosions after a loss of power and cooling. A Tokyo Electric official said that workers who were monitoring storage tanks appeared to have failed to detect the leak of water which pooled up around the tank. “We failed to discover the leak at an early stage and we need to review not only the tanks but also our monitoring system,” he said. Continued contaminated water leaks from Fukushima has alarmed Japan’s neighbors South Korea and China. Tokyo Electric, also known as Tepco, has been criticized for its failure to prepare for the disaster and been accused of covering up the extent of the problems at the plant. Massive amounts of radioactive fluids are accumulating at the Fukushima plant as Tepco floods reactor cores via a jerry-rigged system to keep melted uranium fuel rods cool and stable. The water in the improvised cooling system then flows into basements and trenches that have been leaking since the disaster. Highly contaminated excess water is pumped out and stored in steel tanks on elevated ground away from the reactors, which lie adjacent to the coast. About 400 tons of radioactive water per day has been pooling and kept in storage at Fukushima. In order to keep up with the pace of the contaminated water flow, Tepco has mostly relied on tanks that are bolted together with plastic sealing around the joints. Those tanks are less robust – but quicker to assemble – than the welded tanks that the utility has recently started installing. The latest leak came from the more fragile type of tank, which Tepco plans to keep using, although it is looking at ways to improve their strength, said Tepco official Masayuki Ono. Tepco said it did not believe that water from the latest leak had reached the ocean, about 500 meters (550 yards) away. In recent months the plant has been beset with power outages and other problems that have led outside experts to question whether Tepco is qualified to handle the cleanup, which is unprecedented due to the amount of radioactive material on the site and its coastal location. The government said this month it will step up its involvement in the plant’s cleanup, following Tepco’s admission, after months of denial, that leaked contaminated water had reached the ocean. Tepco has also struggled with worker safety. This month, 12 workers decommissioning the plant were found to have been contaminated by radiation. The utility has not yet identified what caused those incidents, which only came to its notice when alarms sounded as the workers prepared to leave the job site. A South Korean Foreign Ministry spokesman confirmed on Tuesday media reports that Seoul had asked Japanese officials to publicly explain what they were doing to stop contaminated water reaching the Pacific Ocean and valuable fishing grounds. “Tepco and the government must come up with ways to stop the leaks as well as to monitor and analyze how much and what sort of radiation is entering the ocean, as well as the affect it is having on fish and sea plants,” Furukawa said. “They also need to make the information available to the public, all over the world, given this is the first case in history where contaminated water from a nuclear plant is flowing into the ocean at this magnitude,” he said.